Yesterday morning was bright and beautiful and I should have taken myself off for a walk but I am a bit hooked on knitting bunny heads at the moment, so I sat and knitted instead. It always happens when I find a new and particularly nice bunny knitting yarn and I'm having fun turning a big bag of yarn that I bought before Christmas into lots of animal heads. This particular yarn isn't just a single ball but a combination of 2 strands knitted together, both from a new brand called Willow and Lark. One is tweedy and rustic and has interesting flecks of subtle colour - Woodland, and the other is a thin strand of very fluffy blended mohair and silk - Plume. The nice thing is that there are similar shades in both different yarns so they match up perfectly. I've done the same thing in the past (with Rowan Felted tweed and Rowan Kid silk haze) and the two new Willow and Lark yarns are similar to those and combine beautifully to create a lovely knitted fabric that has texture, fuzz and subtle tones - in short perfect for bunny heads. I like the lovely halo that you get around their little ears and you can even brush the finished fabric to tease out extra mohair strands and increase the fuzziness. The other reason I'm finding it a bit hard to step away from the knitting at the moment is because I want to release an updated version of the 2 rabbit patterns with a couple of extra head options, so I am knitting samples, tweaking a stitch here and there and making sure I'm happy with the instructions. 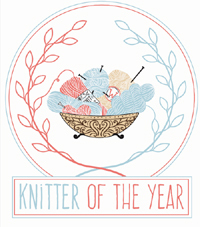 I'll keep the blog here updated with news when the pattern is ready but it will be a free update. So a sunny day passed by outside while I sat inside knitting, but by yesterday evening the winds were beginning to build in strength ahead of an overnight winter storm. Happily I was still snuggled up with tea and chocolate and feeling cosy. When I was a child I loved the sound of storms at night, it was thrilling and a bit scary. But being an adult and a homeowner puts an entirely different complexion on things and instead of lying there listening to the sounds of the storm and pretending that you're on an old-fashioned sailing ship with big sails and creaking decks, you're lying there wondering how many roof tiles are flying off and how expensive it will be to get the roof fixed. Happily for us all of the roof tiles seem to be intact this morning, though we do have a couple of loose fence panels and the profile of the hill that I can see from my kitchen window looks somehow different, so there may be a tree or two down up there. 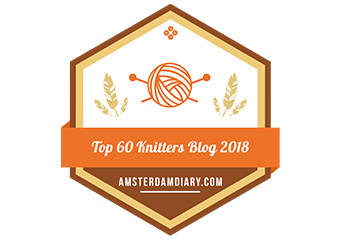 PS: Before I go I just wanted to say a big thank you to Feedspot for including this blog in their top 50 UK Knitting blogs. 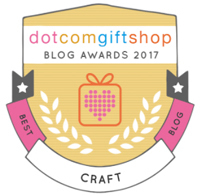 I'm in some very good company, so if you are a fan of knitting blogs then it might be worth visiting and seeing who else is included. 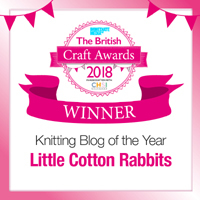 At the beginning of December I bought 2 of every shade suitable for bunny knitting and received the tote bag as part of a promotion that was running (a free bag with a minimum spend of £10 while stocks lasted).